Today may be a bad day to play Star Trek Online. Turns out 99% of the Star Trek MMO's Klingon content will be PvP — which mean plenty of people may just pass on the game entirely. Klingon Captains have the same number of skills available as their Federation counterparts, including the same professions. Your Klingon Captain can be a Science, Engineering or Tactical officer. However, they must advance through PvP, as they will not have access to the same amount of player-vs.-environment content as Federation players at launch. That's not to say Klingons won't be a robust faction. While they are PvP-focused, PvP in Star Trek Online is something we designed from the ground up to be a viable advancement path, meaning both Klingon and Federation players can reach a rank of Admiral solely through PvP. Players can engage in team vs. team, Federation vs. Klingon, Klingon vs. Klingon and Federation vs. Federation combat. What's more, certain PvP maps will have PvE objectives over which opposing players can struggle. The fact is, people make their buying decisions early and he felt it was important to have Klingons in the game, even if they were not as deep as everyone would like, from day one. "If I sit back and wait for it to be perfect, frankly people aren't going to wait around for it," he added. Bottom line, too bad. 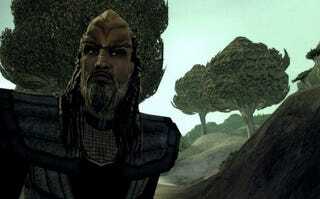 The Klingon are going to be boring, or no Star Trek Online. Still the Klingons in the game will have their own ships, bridge officers and territory, if that helps at all.